A technician demonstrates how a patient with a traumatic brain injury uses the computer assisted rehabilitation environment virtual reality to help with movement and balance at the National Intrepid Center of Excellence in Bethesda, Md. Since the Vietnam War, doctors have seen an increase in service members returning from combat with traumatic brain injuries from blasts. 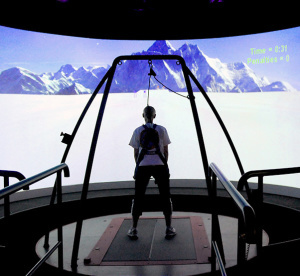 At the National Intrepid Center of Excellence (NICoE), a directorate of Walter Reed National Military Medical Center in Bethesda, Maryland, doctors and therapists use research and technology to help service members with TBI in their recovery. Dr. Louis French, the center’s deputy director, said NICoE uses this research and technology to study the structure and metabolic activity in the brain, how it metabolizes glucose, where the blood flow is, and the electrical activity in the brain. NICoE is the only clinic in the nation to have a magnetoencephalography scanner, or MEG, dedicated to the treatment of TBI, said Dr. John Hughes, a neurologist and the director of the MEG lab. “It’s really unprecedented that an institution can have this dedicated to one disorder,” he added. The MEG is a technique used to measure and record the brain’s magnetic fields during its normal activity and provide insight into how the brain is functioning, Hughes said. NICoE uses it to study the electrical oscillations in a mildly traumatic brain as well as the physiology of the cortex of the brain and the psychological issues related to it, he said, noting that there are only 40 MEG labs in the country. The MEG requires liquid helium that goes over more than 300 sensors placed just above the scalp to keep the sensors very cold. “I’m thrilled to be able to apply this technology to this specific problem,” Hughes said. He said the MEG is similar to the electroencephalography, or EEG, used to record the electrical component of brainwaves, but the magnetic fields require the more sophisticated instrumentation. “If we continue to study traumatic brain injury with MEG, we can’t fail to make significant insights into understanding the physiological basis of symptoms of TBI, and we’ll reap huge benefits in terms of developing therapies specific to those physiological issues we can discover with MEG,” he added. Another device NICoE uses is the ActiGraph watch, used to record sleep patterns. Similar to a fitness tracker, patients can wear it instead of needing the sensors used in a traditional sleep study to be attached to their heads, said Dr. Tony Panettiere, a neurology sleep medicine physician. “Most people who’ve had traumatic brain injury who we see often have neurological complaints such as headaches, memory dysfunction, irritability, focus attention issues and sleep issues,” Panettiere said. During a sleep study, he said, the device measures brainwaves, muscle relaxation, how a patient is breathing and heart rhythm. Technicians can tell if a person has sleep apnea or a limb movement disorder. Panettiere said the advantage of the ActiGraph is that the results are less artificial than they’d be if the patient had to sleep with all of the wires attached as they do in a traditional sleep study. “They’re back in their own bed, and we even do it a couple weeks with them wearing the watch if there’s any information that’s contrary to what we’ve found in the lab,” he said. French said the research goes primarily in two directions. The first is in the characterization of patients — understanding the symptoms they have after they’ve been injured through advanced neuroimaging. 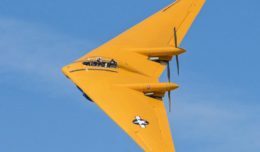 NICoE also has PET CT, CT, 3 Tesla MRI, a magnetic resonance spectroscopy and a number of other dedicated imaging devices for traumatic brain injury patients, said Navy Cmdr. (Dr.) Grant Bonavia, interim chief of the research department and chief of neuroimaging and measurement devices. French said he’s the principal investigator on a congressionally mandated 15-year mandated longitudinal study, which will study the effects of TBI and the expression of symptoms over time. “Our goal is to follow people for 15 years and find out how their symptoms change over time, how they do after having had a brain injury in a military situation, and understand how the brain injury recovery may intersect with the aging process,” he said. 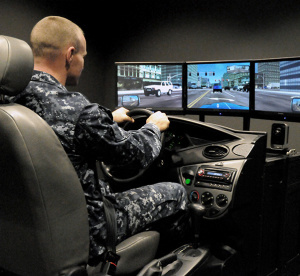 A technician demonstrates how a patient with a traumatic brain injury uses driving assessment and rehabilitation treatment to help in regaining the ability to drive their cars at the National Intrepid Center of Excellence in Bethesda, Md. French said NICoE is working in partnership with the National Institutes of Health, which is giving the center access to some specialized researchers and techniques with these characterization studies. NICoE also is exploring new treatment options, French said. Currently, he noted, NICoE offers animal-assisted therapy, assistive technology, audiology and vestibular services, a brain fitness center, driving assessment and rehabilitation, a computer-assisted rehabilitation environment, family education and art therapy. “We have treatments we provide for people here, and we see those techniques work for people, but we don’t always completely understand them,” French said. “So we want to know a little bit more about. Why do they work for some people and not as well for other people? Is there an optimal time that you should start these treatments? Is there an optimal intensity or dosage that we do for these kinds of things? Some of the treatments NICoE uses are complementary and alternative therapies, such as acupuncture and art therapy. Sleep and nutritional education play important roles in some of his patients’ lives, he added. French, who’s been working with TBI care for 16 years, said the military went from being behind the curve to establishing a care system at every major troop center at every major military treatment facility today. He said Intrepid Spirit Centers are being built around the country and will share lessons learned with NICoE. “We’re trying to develop a national care system that’s all linked together so we can communicate about best practices,” he said. Inpatient screening and consultation services are available at Walter Reed, French said. French said NICoE wants to ensure patients have access to all aspects of the health care system. Bonavia said the research and technology at NICoE is vital. The center’s location on the Walter Reed campus allows access to a number of different resources, he said, and being across the street from the National Institutes of Health provides easy access to a significant presence in researching and taking care of patients with TBI and psychologic health problems.